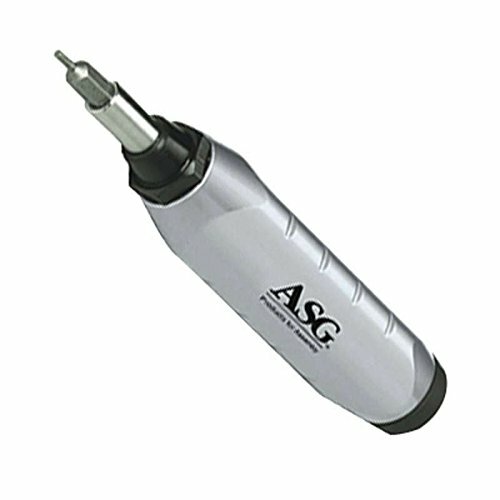 ASG Straight Electric Production Screwdrivers are for assembly applications. Include power cable and bits. Control module required.Specification: Driver and Wrench Product Grouping: Electric ScrewdriversItem: Electric Production ScrewdriverAutofeed: NoClutch Type: Shut OffMax. Torque: 5 in.-lbNo Load RPM: 1000Voltage: 20/30VDCCord: NoneCorded/Cordless: CordedHandle Type: StraightAmps: 2.5Chuck Size: 1/4"Tool Speed Control: VariableControl Module Required: PS-55Features: Inline Lever Start Brushless, Auto Shut OffApplication: AssemblyTool Length: 7-1/2"Tool Weight: 0.88 lb.Includes: Power Cable, (3) Bits, (2) Torque Springs"
ASG Straight Electric Production Screwdrivers are for assembly applications. Include power cable and bits. Control module required.Specification: Driver and Wrench Product Grouping: Electric ScrewdriversItem: Electric Production ScrewdriverAutofeed: NoClutch Type: Shut OffMax. Torque: 11 in.-lb.No Load RPM: 900Voltage: 20/30VDCCord: NoneCorded/Cordless: CordedHandle Type: StraightAmps: 2.5Chuck Size: 1/4"Tool Speed Control: VariableControl Module Required: PS-55Features: Inline Lever Start/Push to StartApplication: AssemblyTool Length: 8"Tool Weight: 0.79 lb.Includes: Power Cable, (3) Bits, Hex Wrench"
ASG Straight Electric Production Screwdrivers are for assembly applications. Include power cable and bits. Control module required.Specification: Driver and Wrench Product Grouping: Electric ScrewdriversItem: Electric Production ScrewdriverAutofeed: NoClutch Type: Shut OffMax. Torque: 18 in.-lb.No Load RPM: 700Voltage: 20/30VDCCord: NoneCorded/Cordless: CordedHandle Type: StraightAmps: 2.5Chuck Size: 1/4"Tool Speed Control: VariableControl Module Required: PS-55Features: Inline Lever Start, Auto Shut OffApplication: AssemblyTool Length: 8"Tool Weight: 0.75 lb.Includes: Power Cable, (2) Bits, (2) Torque Springs, Replacement Brushes"
ASG Straight Electric Production Screwdrivers are for assembly applications. Include power cable and bits. Control module required.Specification: Driver and Wrench Product Grouping: Electric ScrewdriversItem: Electric Production ScrewdriverAutofeed: NoClutch Type: Shut OffMax. Torque: 14 in.-lb.No Load RPM: 900Voltage: 20/30VDCCord: NoneCorded/Cordless: CordedHandle Type: StraightAmps: 2.5Chuck Size: 1/4"Tool Speed Control: VariableControl Module Required: PS-55Features: Inline Push to Start, Auto Shut OffApplication: AssemblyTool Length: 9-1/2"Tool Weight: 1.46 lb.Includes: Power Cable, (3) Bits, (2) Torque Springs, Replacement Brushes"
ASG Straight Electric Production Screwdrivers are for assembly applications. Include power cable and bits. Control module required.Specification: Driver and Wrench Product Grouping: Electric ScrewdriversItem: Electric Production ScrewdriverAutofeed: NoClutch Type: Shut OffMax. Torque: 16 in.-lb.No Load RPM: 1000Voltage: 20/30VDCCord: NoneCorded/Cordless: CordedHandle Type: StraightAmps: 2.5Chuck Size: 1/4"Tool Speed Control: VariableControl Module Required: TLB-PS60Features: Inline Push to StartApplication: AssemblyTool Length: 9-29/64"Tool Weight: 1.19 lb.Includes: Power Cable, (2) Bits"
ASG Straight Electric Production Screwdrivers are for assembly applications. Include power cable and bits. Control module required.Specification: Driver and Wrench Product Grouping: Electric ScrewdriversItem: Electric Production ScrewdriverAutofeed: NoClutch Type: Shut OffMax. Torque: 14 in.-lb.No Load RPM: 900Voltage: 20/30VDCCord: NoneCorded/Cordless: CordedHandle Type: StraightAmps: 2.5Chuck Size: 1/4"Tool Speed Control: VariableControl Module Required: PS-55Features: Inline Lever Start, Auto Shut OffApplication: AssemblyTool Length: 9-1/2"Tool Weight: 1.46 lb.Includes: Power Cable, (3) Bits, (2) Torque Springs, Replacement Brushes"
ASG Straight Electric Production Screwdrivers are for assembly applications. Include power cable and bits. Control module required.Specification: Driver and Wrench Product Grouping: Electric ScrewdriversItem: Electric Production ScrewdriverAutofeed: NoClutch Type: Shut OffMax. 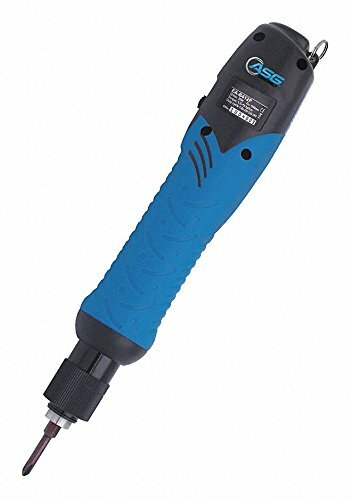 Torque: 12 in.-lb.No Load RPM: 900Voltage: 20/30VDCCord: NoneCorded/Cordless: CordedHandle Type: StraightAmps: 2.5Chuck Size: 1/4"Tool Speed Control: VariableControl Module Required: PS-55Features: Inline Lever Start Soft Stop, Auto Shut OffApplication: AssemblyTool Length: 9"Tool Weight: 1.46 lb.Includes: Power Cable, (3) Bits, Replacement Brushes"
ASG Straight Electric Production Screwdrivers are for assembly applications. Include power cable and bits. Control module required.Specification: Driver and Wrench Product Grouping: Electric ScrewdriversItem: Electric Production ScrewdriverAutofeed: NoClutch Type: Shut OffMax. Torque: 22 in.-lb.No Load RPM: 750Voltage: 20/30VDCCord: NoneCorded/Cordless: CordedHandle Type: StraightAmps: 3.5Chuck Size: 1/4"Tool Speed Control: VariableControl Module Required: CLT-60Features: Inline Lever Start, Auto Shut OffApplication: AssemblyTool Length: 10"Tool Weight: 1.7 lb.Includes: Power Cable, (3) Bits, (2) Torque Springs, Replacement Brushes"